Sapphires figure prominently in numerous beliefs and traditions, both past and present. For centuries, sapphires have been used for alchemy, magic, healing rituals, and astrological prognostication. Early priests and scholars believed that precious gemstones, including sapphires, had specific “virtues” that could be used to benefit man if their powers were properly harnessed. According to legend, Helen of Troy (c. 12th century B.C.) owned a large star sapphire, which was believed to hold the key to her desirability. The famous “seal” of King Solomon (c. 1000-931 B.C.) was legendary, not only because it was an inscribed sapphire, but also because it apparently gave him power over spirits in the air, earth, and underworld. During the Hellenistic period (400-100 B.C.) when gemstones were associated with specific deities or occult powers, sapphires were routinely inscribed with the head of Jupiter (Zeus), the god of the sky. During this same period, Arabian kings were known to wear sapphires to protect themselves from envy and physical injury. Early sailors believed that sapphires would protect them from drowning at sea. In Medieval times, sapphire was used as a test for infidelity; it was thought to change color if worn by the unfaithful. The wives of the crusaders were tested with sapphires (including color change sapphires!) when their husbands returned from their campaigns. Sapphires have ancient associations with religion. The ancient Persians believed that Earth was balanced on a giant sapphire that was reflected in the color of the heavens. Buddhists believed that sapphires had a calming effect on people, which facilitated their devotion to prayer and meditation. The seventh heaven of Islam is bathed in a shining light of rubies, sapphires, and emeralds. Sapphires are key symbols in the Christian religion, where they are associated with chastity, piety, and repentance. To the early Christians, sapphires symbolized heaven and their yearning for eternal life. Tradition holds that Moses’ Ten Commandments were written on tablets of sapphire so strong that a hammer swung against them would be smashed to pieces. Each of the Apostles was associated with a specific gem, and sapphire was known as the stone of St. Paul. Charlemagne owned an enormous sapphire amulet that he wore prominently to display his devotion to God. In the 6th century, a papal bull decreed that every cardinal was to wear a sapphire ring on the right or “blessing” hand. In the 12th century, this practice was encouraged because it was believed to suppress sexual desires, promoting chastity and piety. Religion and politics weren’t the only things that Sapphire was a part of in history, the magical allure of these stones was also used for medical purposes. During the 12th to 14th centuries, members of the Christian clergy became interested in “lithotherapy” – the practice of using gemstones to heal the sick. 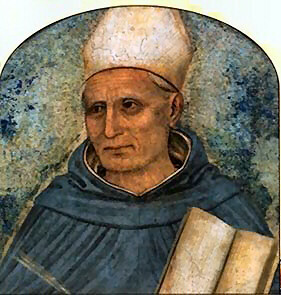 The father of the modern botany and zoology, Dominican monk Albertus Magnus (c. 1193-1280), was one of many serious scholars who dabbled in the study of lithotherapy. Skeptics were dismissed as heretics, and scholars who did not enthusiastically support tenets of lithotherapy were threatened with excommunication. The Christian clergy were not the only scholars fascinated with the power of sapphires. Alchemists also sought to harness their legendary powers. Sapphires were also the favorite stone of necromancers, who employed them to summon spirits of the dead for prophecy and black magic. In ancient times, sapphires have been used to protect the wearer by boosting the immune system. They were said to calm overactive body systems, treat disorders of the blood, and regulate the glands. They were believed to alleviate the suffering caused by rheumatism, allergies, biliousness, hiccups, and cancer. They were even said to cure chronic fevers and epilepsy. Blue sapphire was thought to increase the lifespan, end headaches, nightmares, and nosebleeds when placed on the forehead. The ancient Egyptians used ground sapphires for eye-washes! The idea that sapphires were beneficial for the eyes persisted through the Middle Ages. The Dominican monk, Albertus Magnus (1327-1377) recorded that he saw a sapphire remove a foreign body from the eye. In 1391, a sapphire was donated to St. Paul’s Church in London by Richard-de-Preston, a grocer, so that it might cure the eye ailments of Pius petitioners. Early medieval writers believed that sapphires could reduce outbreaks of rage, dispel malicious behavior, and repel envy. They were considered helpful for treating colic, mental illness, and hysteria, and they were considered a good antidepressant. Eases ailments of the stomach and respiratory system. Strengthens the mind, liver, and spleen. Aids the kidneys and circulatory system. It is also the best place to wear a ring if you wish for happiness and joy. Bolsters the reproductive system, knees, legs, and feet. Besides medical and religious practices the involved sapphires, spiritual uses for these stones have also been devised throughout the years. Sapphires are known as the stones of wisdom and serenity. They are used to release mental tension and dispel depression. They are believed to facilitate meditation, calm the mind, and provide the mental clarity required to surmount obstacles. Exceptional for their protective qualities. The rays of the star represent faith, hope, and destiny. Bring prosperity, stimulate the intellect and remove toxins from the body. Open the crown chakra, which elevates spirituality and cosmic consciousness. Especially effective for chakra healing—especially the throat chakra. They are a good stone for those who are intent on finding spiritual truth. Improve meditation and psychic abilities. They are also effective in calming overwrought emotions. Stimulate the heart chakra improving one’s capacity for compassion, loyalty, and trust in others. They also enhance your ability to recall dreams. Remove emotional stumbling blocks and illuminate the path to higher consciousness. They attract positive elements into your life. Build both careers and the power of intuition. Since precious metals are energy amplifiers, the metal used to mount sapphires also have the ability to augment the power of each of the sapphire varieties. Gold’s biocompatibility and conductivity have been recognized for ages. Worn on the body, it is said to be helpful for treating blood, skin, and heart conditions as well as epilepsy, scoliosis, dyslexia, and autism. Because gold is chemically inert, it is also believed to prevent spiritual corrosion, fatigue, and negativity. If the wearer is mindful to avoid a tendency toward greed, gold serves to relieve tension, anger, and feelings of inferiority. Yellow gold harnesses the warmth of the sun and it promotes self-awareness and the realization of dreams. Rose gold enhances spirituality, and white gold channels the energies of both the sun and the moon. Silver is often associated with the feminine characteristics of compassion and empathy. Because of these traits, it helps to channel the positive energy of gemstone–including sapphires–into the body. The cultures of the Indian subcontinent have studied different aspects of gemstones for centuries. Ancient Sanskrit texts give us a great deal of information on Sapphire’s ability to influence the cosmos. 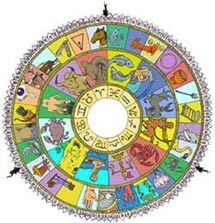 Jyotisha refers to an ancient Indian system of astronomy and astrology, also known as Vedic Astrology. Jyotisha is a form of predictive astrology; prognostication centers on an evaluation of the natal horoscope as it relates to the moment and subject of inquiry. The practice of Jyotisha is based on the sidereal zodiac, which is different from the tropical zodiac used in Western astrology. Jyotisha is primarily concerned with the sun, the moon, five visible planets, and two lunar nodes (called Rahu and Ketu). These “planets,” as they are collectively called, impact our lives on many levels and contribute to our mental, physical, material, and spiritual well being. Each of the planets emits colored rays of light: the rays of the Sun are red, Moon orange, Mars yellow, Mercury green, Jupiter blue, Venus indigo, Saturn violet, Rahu ultraviolet, and Ketu infrared. When the rays are out of balance or “afflicted,” physical or emotional sickness occurs. Imbalances result when the planetary rays are distorted or improperly received by an individual. Gemstones have long associations with astrology because as crystalline forms of energy they retain the astral influences of the sun, moon, and planets longer than any other known substance. Because gemstones have the ability to absorb, reflect and radiate different frequencies of light, they can be used to correct or amplify planetary influences. Practitioners of Jyotisha prescribe different gemstones to (a) promote the positive effects of favorable birth planets or (b) ameliorate the effects of unfavorable birth planets. Ruby, which is associated with red light; Pearl-orange light; Red Coral-yellow light; Emerald-green light; Yellow sapphire-blue light; Diamond-indigo light; and Blue Sapphire-violet light. It should be noted that White (colorless) Sapphires might, on occasion, be substituted for diamonds because they too are associated with indigo light. 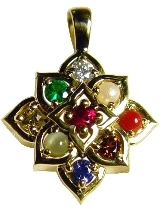 One of the most universal of all amulets is the Navaratna, or “nine gems.” Navaratnas are set with the nine gemstones of Jyotisha, which are known to influence the health and destiny of the wearer. White or colorless sapphires are never used in Navaratnas because they are only considered as a substitute, not primary, planetary gems. Since Jupiter is the planet of material prosperity, progeny, and spiritual growth, many consider this planet of critical importance to their lives. People who suffer from depression, poverty, bad luck, blood or immune disorders, respiratory ailments, and liver problems may find their problems ameliorated by yellow sapphire. Although yellow sapphires can be effective if they are two karats in size, experts typically recommend that they be at least three karats. Care must be taken in prescribing blue sapphire to treat a weak or afflicted planet Saturn in the natal chart of an individual, and it must be considered in conjunction with the individual’s ascendant, or rising sign. Saturn is considered a malefic planet; if poorly positioned, the individual may live a short lonely life full of sorrow, disappointment, bad career choices, and fear. Saturn rules the nails, teeth, bones, and nervous system. Blue sapphire can be used to treat heart disease, tuberculosis, rheumatism, deafness, mental and nervous disorders, and baldness. Blue sapphires of five karats are typically recommended, but effects will be realized if the stone is at least two karats in size. Although diamond is usually recommended for an ill-positioned or weak Venus, white (colorless) sapphire may be used as a substitute or secondary gemstone. If the planet is afflicted, there may be problems in marriage or other relationships, lack of passion and sexual drive, or an absence of beauty and luxury in life. Venus also rules the reproductive system, kidneys, eyes, cheeks, and throat. There are several ways to harness the healing powers of gems. Some practitioners make elixirs or tinctures, which are taken internally. However, most experts agree that the most effective means is to wear gemstones that touch the skin. It is important to note that Jyotisha benefits the wearer of gemstones; crystals do not have the same effect. Jyotish gemstones must also be natural, untreated gemstones. Synthetic sapphires have not been exposed to planetary rays over countless eons, and therefore cannot be used in Jyotisha. Heat treatment also negates Sapphire’s inherent energy, rendering it useless for therapeutic applications. To harness the power of sapphires, they must be eye clean. Wearing flawed sapphires, even in ignorance, can have dire effects—especially in the case of blue sapphires. An experienced Vedic astrologer will also inform you of the means to purify your gemstones, the best time and day to wear the gemstones, and the length of time they should be worn to have the greatest effect. Plus, i like the colour of blue!